Recently I had to upgrade a SQL 2008 R2 Express edition to Standard. I knew with SQL 2008 R2 this was very easy to do using the wizard. However on the server I was trying to change the edition on I kept getting an error during the checks about architecture mismatch. I thought this was weird since the installer includes both x86 and x64 versions and choose the correct version based on the OS. Well it turns out the application that installed SQL Express installed the x86 version even though the OS is x64. 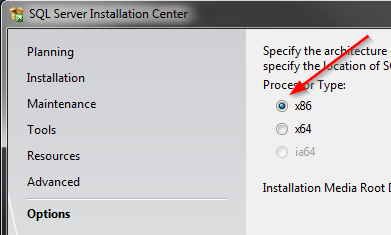 When starting the SQL installer it automatically chose the x64 version to match the OS. No matter what I did it would not find my x86 version of SQL Express already installed. I found lots of other people on the Internet with the same issue but it looks like most people just gave up and installed SQL over again. I knew there had to be a way and after messing with the SQL installer I found it. Buried in the Options of the SQL installer is a way to choose your processor type. Changed it to x86, started the installer over again and bam instantly recognized the Express version installed. 5 minutes later I was happy camper. Hopefully this help out someone else that was having the same issue!